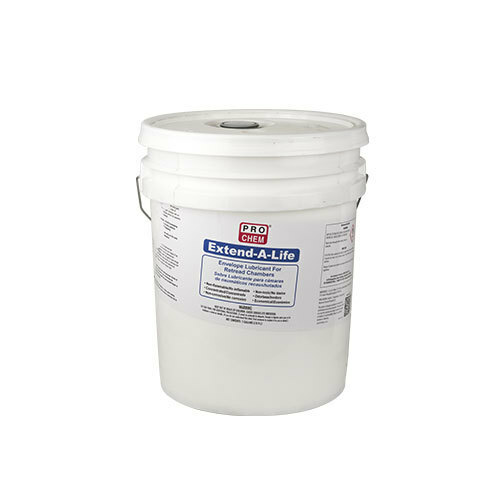 EXTEND-A-LIFE | Pro Chem, Inc.
EXTEND-A-LIFE is a lubricant used on the “envelopes” which encase the tire being retreaded prior to going into a retread chamber. This envelope acts as a seal which tightens around the tire casing while the retread rubber cures within the chamber. Using this product can prevent envelope tears while protecting the integrity and quality of the envelopes for continued use. To Lubricate Envelope: Dilute one part product with up to 8 parts water. Apply to inside of envelope with a quart bottle with trigger sprayer set on the mist setting. Spraying on envelope while hot speeds the drying process. Reapply as needed.